"One challenge that I hear from students in my workshops is mental chatter. Here's the replay of an online class I did on how to still the mind and meditate more deeply." I started meditating in my teens and was impatient for progress. I wanted a totally still mind immediately and started to fall into a pattern of "trying" and eventually "willing" to even "forcing" my consciousness to be still. When I learned to start relaxing and enjoy the sensations of meditation I found my mind to be more still on it's own. It wasn't until I started studying the chakras and creating the chakra workshop that I teach that I realized why this was. I found that when a chakra was excessive it was due to old trauma that triggered a fight response and was energetically "armored" as a result. When a chakra was deficient, it was the result of trauma where there was a flight response where the consciousness vacated the situation and the body to minimize the experience of trauma. I realized that the basic motivational mechanism of consciousness of moving toward pleasure and away from pain could be used to increase mental clarity and presence in meditation by focusing on and expanding what is pleasurable during a meditation and resolving or removing what is uncomfortable or painful. When I put this together with the idea of feedback loops, sensing subtle energy and how appreciation causes expansion, my mind has never been more quiet and focused. It's now easy for me to experience this and my meditations are now more energized and blissful. The more I use this with the feeling of appreciating subtle energy flow while meditating, exercising or doing other normal daily activities the more it expands and the more present I am with whatever I am doing. A side bonus is that I am now able to enjoy those things more and the external results are often better as well. 6:19 Why Meditate and Explore Consciousness? Play, pause and fast forward to your favorite moments, watch the presentations that you choose. It's up to you. Enjoy this revolutionary material for the next 90 days -- August 25 - November 25. Want to learn the latest Science and Knowledge that helped Drunvalo develop his latest work "Cosmic Grace"?? Click here for an International Time comparison tool. 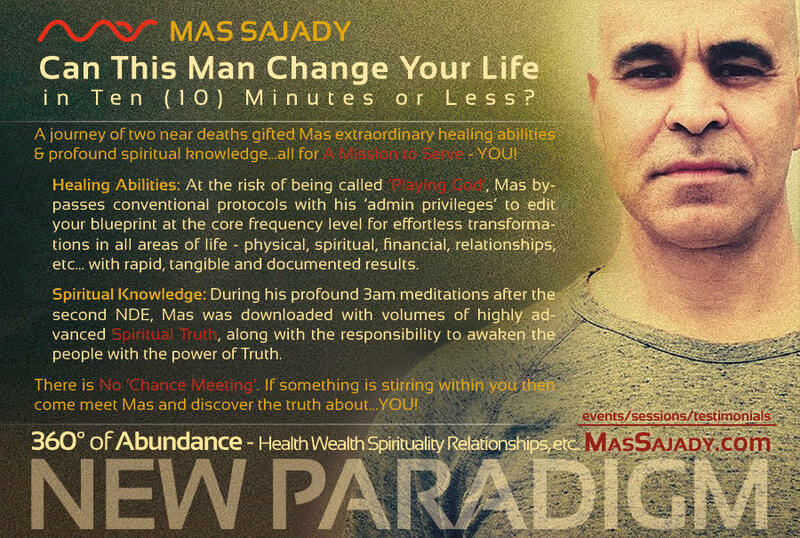 Meet Mas Sajady, a former programmer with a successful business and a normal family life.After surviving his second near death experience and a journey through dark nights of the soul, Mas received extraordinary abilities to manifest miraculous healing and transformation for you in all areas of life - physical, spiritual, financial, relationships, etc... with rapid, tangible & documented results. Mas works on the core frequency level to help redesign and reprogram your soul blueprint, materializing fast and tangible results in all areas of life. He acts as the conduit for pure energy to manifest this healing from a higher energy field.... "How do I connect to the Pure Source even Stronger" to help you be who you are and get what you want. This beautiful little thing was found and filmed off the Coast of California on the morning of 3-22-15. The mini alter was created by 3 amazing women during a morning meditation session on a secluded beach section near Carpinteria State Beach California. A School of Remembering staff member was walking on the cliffs above and witnessed the peace and beauty in which this was created and climbed down to capture just a few minutes for you..
Share your comments and let us know if you would like to see more. Remember Who We Are, Who We Have Always Been and Return to Source. Our goal is always to support our Global Consciousness Projects and Cosmic Grace Master Level Members. Cosmic Grace Workshop - Help Present Drunvalo's Work Visually!! As you may have heard, Drunvalo titled his newest workshop, "Cosmic Grace - Return to Source". This event stirred the imagination of thousands and Drunvalo looked to the cosmic community for inspiration. Creative Lightworkers from all over the Globe submitted amazing works of art to represent the ideas of Cosmic Grace - Returning to Source. Of the hundreds of submissions the top 5 finalists were chosen for your vote! The WINNER with 23% of the global vote is.